Just when I thought I had seen it all, I found out that there is an underwater postbox! Yes, an actual custom letterbox below the sea or ocean, that you can post your mail that will be delivered anywhere in the world…crazy or what? It must be a record in the Guinness Book of Records. Well, now you have a choice of these unique postboxes, if you are on holiday in the Republic of Vanuatu (islands in the Pacific Ocean), Pulau Layang-Layang (Malaysia) or Susami, Wakayama (Japan). When on holiday, my wife and I always send postcards to family at home. Many people still send postcards from their holidays abroad but have you ever sent one from underwater? Tourists wearing masks, fins and snorkels or full diving gear, can visit these underwater and unique postboxes. Once there they are able to post special letters and postcards, which have been treated to make them waterproof. The Pulau Layang-Layang underwater postbox is a custom letterbox that lies 40 metres below the surface. Deputy Minister of Communications and Multimedia Jailani Johari said the location of the postbox had made it the deepest in the world, beating the one in Susami, Wakayama, Japan which is only 10m metres deep and currently holding the Guinness World Record. I apologise on behalf of PostBox Shop, we do not sell underwater postboxes, but we do sell almost any other postbox you need. PostBox Shop provide an extensive range of individual and commercial postboxes, letterboxes and mailboxes, each designed with access, security and your lifestyle needs in mind. With many years experience, we specialise in stylish practical solutions to suit your budget, products including; freestanding postboxes, surface mounted postboxes, recessed letterboxes, through the wall postboxes, door side panel postboxes, parcel boxes, mail chutes, anti arson postboxes, bespoke postboxes, apartment letterboxes and much more. Residential and commercial properties can benefit from installing a railing and gate letterbox, which has a long vertical mail slot, ideal for small packages. This lockable letterbox has 2 keys and fixtures supplied and have been manufactured from gauge steel, with a black powder coated durable finish (white, grey and green options are also available). The design allows you to retrieve your post safely and securely from the back of the box. If you have any questions about our railing and gate letterbox, or any of our letterboxes, simply contact us today. Sorry, Scottish salmon fish farmers will have to find an underwater postbox elsewhere…try Vanuatu, Malaysia of Japan. Mind you, PostBox Shop will only source their products from reliable manufacturers in the UK and Europe where we can guarantee that only the finest materials are used. We will not import and supply the inferior goods from the Far East that are readily available in today’s market on other Websites and retail outlets. We conform to British & European Standards (BSEN13724), Secured By Design New Homes Guide 2014 and are Royal Mail compliant. Sort your post today with our huge range of postboxes, letterboxes and mailboxes, in a variety of designs, colours and finishes, from traditional to contemporary designs. 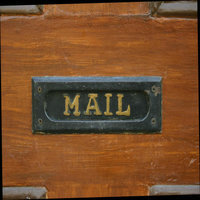 You can even create your own custom painted letterbox or postbox. Find the right letterbox solution for your property…visit PostBox Shop.